Address: 1056 Budapest, Március 15. tér 8. The hotel has 85 rooms. 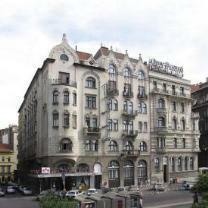 City Hotel Matyas was the first member of the City Hotel chain. The hotel - established above the famed Matthias Cellar Restaurant - is located in the centre of Budapest just a couple of minutes from the pedestrianized Váci Street lined with elegant boutiques. City Hotel Matyas *** is the first member of the City Hotel chain, located in downtown Budapest, 50 meters from the pedestrian area, elegant Váci street with shops. The 85-room hotel awaits its guests with the famous historic Mátyás Cellar Restaurant. Standard Room: Comfortable, bright rooms with bathroom with shower. Rooms have either a double bed or twin beds. Room size is 20 m2 on average. Amenities: bathroom with shower, telephone, radio, TV with satellite programs, pay-TV, minibar, air-conditioned room on request (+ 10 Euro surcharge). Suite Two-room suites feature a living room and a spacious bedroom. The living room has a seating area for guests ’convenience, with standard room amenities. This suite measures 35 m2. Amenities: bathroom with shower, telephone, radio, TV with satellite programs, pay-TV, minibar, sitting room. Famous, historic Matthias Cellar Restaurant awaits its guests with Hungarian cuisine, excellent wines and gypsy music. Breakfast buffet, safe at reception, laundry service, drink bar, Internet in lobby, luggage storage, program organizing, taxi, banquet halls (Molnár street, 5 minutes from the hotel).